Home » Posts Tagged "Leonardo DeCaprio"
I loved the fashions (some by Prada and Miu Miu) the jewelry (Tiffany’s) the hair accessories (hardly any feathers, much more sophisticated) the hair (wigs, I think by Kerry Warn) the cloche hats, and the eye makeup very today rather than of the era but beautiful. The 3-D was interesting, once you got used to it, some overdone, loved the titles at the end. The movie was far from perfect but fun, better than I thought it would be with all the Baz bashing- just forget the beloved F. Scot Fitzgerald book, enjoy it. As Gatsby, Leonardo DiCaprio’s acting a bit O.T.T., his hair dyed blonder, a little wave, Elizabeth Debicki, who plays Jordan Baker, didn’t have much of a part but she came off as a future star – we’ll be hearing more of her, and Daisy’s husband, Tom Buchanan (Joel Edgerton.) 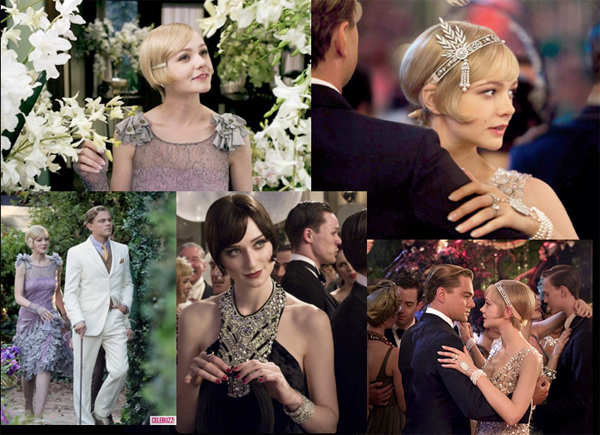 Carey Mulligan as Daisy Buchanan was lovely, wearing great fashions and jewelry. Baz Lurhmann was Baz, better than Moulin Rogue, which I didn’t like, but still Baz with his Long Island computer-generated , sometimes cartoonish Gatsby filmed in Australia. 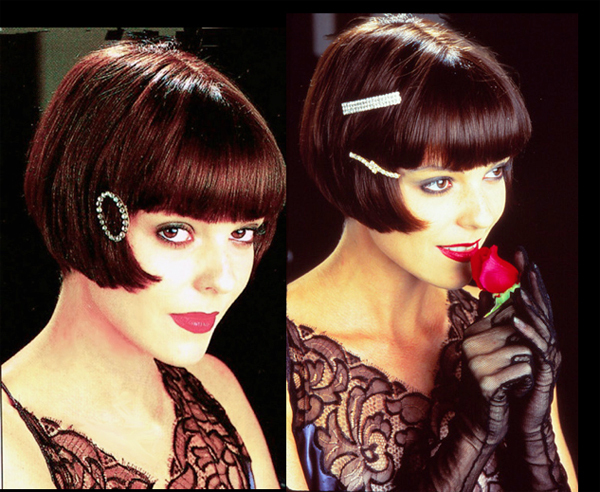 Look for hair and fashion inspiration in these three collages of photos – top collage, of Daisy (Carey Mulligan), Gatsby (Leonoard di Caprio) and Jordan (Elizabeth Debicki) from Baz Lurhmann’s Great Gatsby which opened nationwide “everywhere” in the US today, Friday, May 10, and will open the Cannes Festival on May 15, out of the competition. Oscars? Only for Costume Design, I think. Maybe Special Effects.